Skincare at the best of times can be so hit and miss. You can pay £30+ or £10 for something and not like it. 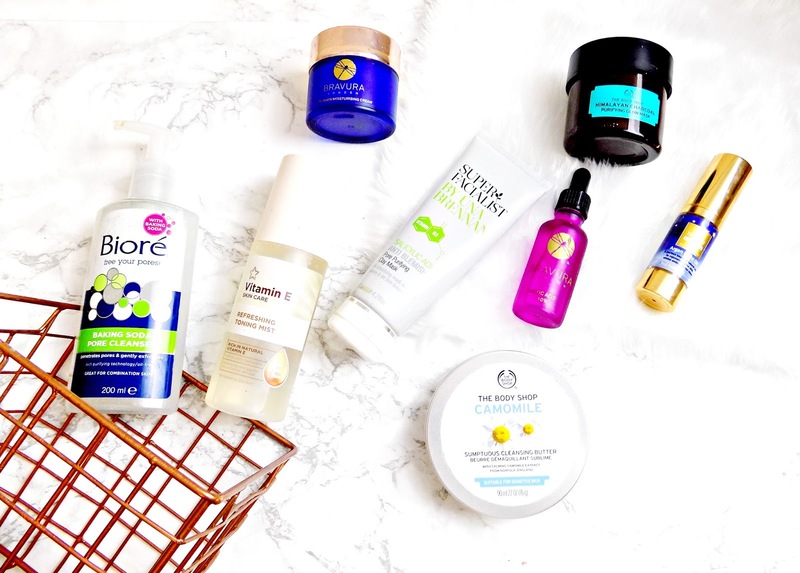 But on the mission for perfect skincare I've found some great affordable product that really work without breaking the bank. So today I thought I'd share them with you guys. For reference, I have dehydrated skin that is prone to breakouts. I was really taken by surprise with this. I thought it was aimed at oily skins and it would dry my skin out more. But this really doesn't. It has a light gel texture with gentle scrubby particles in it. I use this as a second cleanse. I wouldn't recommend this as a first cleanse because you can't get it near your eye or it will sting. But after rinsing it off my skin is so smooth. I've also noticed I get less breakouts when using it too. Plus this is really cheap. This is a balm cleanser, that looks like lard in a pot, but once it's massaged into the skin it melts into a really nice nourishing oil. It destroys makeup and leaves my face feeling fresh and clean, without being stripping. This is also very similar to the Balm Cleanser that's part of the Caroline Horins 2 step cleanser. Chemical Exfoliators have become a staple in my routine. And this lactic acid from Bravura is easily one of the best I've tried and it is so cheap in comparison to some. Lactic acid helps dissolve the dead skin cells that sit on the top of skin, to reveal brighter, new, younger looking skin. It also helps unblock pores so it treats and prevents blackheads and break outs. I like to leave this on for an hour or two, then rinse it of with water. After my skin looks so much brighter and feels a lot smoother. I have a whole post on how to apply and use this here. After having such success with Lactic acid I wanted to try more from the brand. So I decided to pick up this moisturiser and for just over £10 I'm really happy with this. The cream itself is quite thick but absorbs instantly on the skin and leaves it soft and hydrated. It works well under makeup and at night with other products. Another affordable favourite is this Toning mist. This is great as a mid day pickup when my makeup and skin are looking tired. It can also be used as part of a skincare routine, before applying makeup and after. It's just a great multi tasking product. So this isn't the most affordable night oil, but I would expect to pay a lot more for it. Oils are definitely worth investing in too. This one has a rich, nourishing texture that adds an intense shot of hydration to the skin. It's also packed with skin loving ingredients that help repair, protect and nourish the skin. I really like to use this if my skin is feeling really dry and in the morning I'm left with plump, hydrated, soft skin. This mask is aimed at oily skin but it works well on mine. It's a blemish fighting mask, that unclogs pores to leave skin looking brighter, and fresher. It has a clay consistency and dries on the face, but not too dry it's really hard to remove. If I have any spots this really helps to reduce them. I like to leave it on for 10-15 minutes and after removal my skin is so much smoother. I do find this slightly drying on my skin so I like to use a hydrating mask after. Another affordable favourite that really works is this mask from the Body Shop. This has been formulated with Himalayan Charcoal to draw out impurities and refine the skin. It doesn't contain any silicones or mineral oils, just skin loving goodness. This is very similar to the GlamGlow Youth Mud but it's less than half the price. This does have a tingling sensation, which is normal and you can really feel it working. My skin is left smooth, soft and radiant after use. I can't recommend this enough. So there you have my favourite affordable skincare that really works. Have you tried any of these? What are your affordable skincare picks? Too Faced Sweet Peach Glow Kit - Worth the Hype? Too Faced Sweet Peach Palette - Worth the Hype?